Since the move, I've been spending more time at home whilst searching for a new job which has meant I've been able to swap packed lunches for cooked ones. Getting back into a different routine has left me feeling a little bit lost when it comes to food so I've been taking to the kitchen in search of inspiration. These three meals are all lunches I've thrown together over the past week in an attempt to try out new ideas using up things I could find in my kitchen! 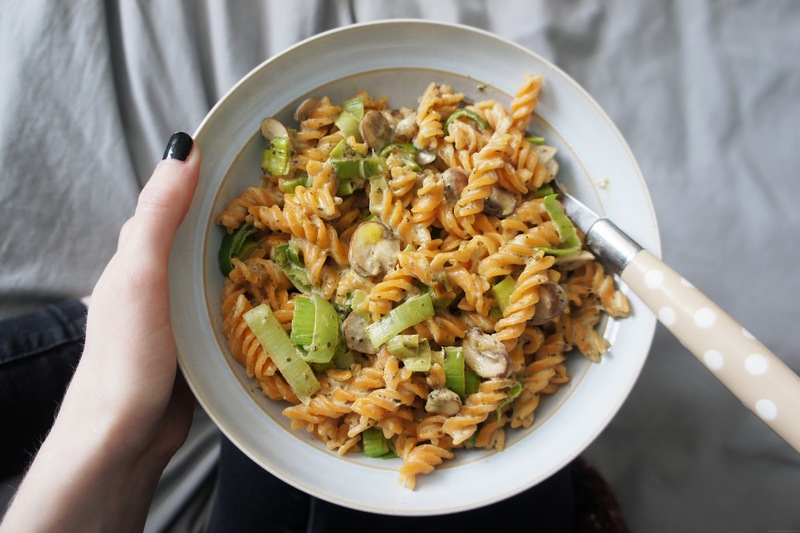 Due to my apparent habit of bulk-buying 'free from' items I like when I find somewhere that stocks them, I discovered several forgotten boxes of red lentil pasta in the cupboard and decided it should be the base for a quick lunch. After rummaging around in the fridge I opted to saute leeks and chestnut mushrooms, then once softened I added in green pesto (Sacla's is my top pick!) and a little Oatly cream to make a sauce. I topped the pasta with a drizzle of my favourite cold pressed garlic oil from Norfolk brand Crush. I've tried making a few different kinds of soup in the past with varying degrees of success so it's not exactly my usual go-to lunch option. To make this not-so-photogenic lentil soup I sauteed onion, potato, carrot, courgette and garlic, seasoned with black pepper and salt. Once softened I added in vegetable stock along with dried rosemary, a bay leaf and dried green lentils and left to simmer. Before serving I stirred through some cashew milk to give it a creamier texture and it actually turned out to be pretty tasty, which is lucky as I made enough for a second portion and popped it in the freezer for a quick lunch option another day. Even though half of my gluten free pastas are actually made of rice, this dish was my attempt to not eat yet another pasta lunch. Using water instead of oil, I added green beans, peppers and spring onion to the stir fry along with a couple of grilled vegetable patties (an inexpensive freezer staple!) chopped into small chunks. To give it some flavour I added a spoonful of peanut butter (Pip & Nut is my favourite) and a very generous helping of tamari!